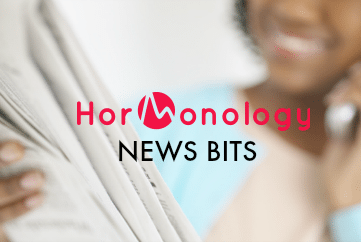 I’m introducing a new Hormonology blog feature: News Bits. Use glycolic peels to combat acne outbreaks? A new study in the Journal of Cosmetic and Laser Therapy reveals that doing a peel at ovulation results in a clearer complexion. Learn more…. A new pilot study in the journal Reproductive Sciences shows that taking the hormone melatonin has the potential to regulate irregular cycles in women with polycystic ovarian syndrome (PCOS). Ask your healthcare provider if this may help you, too. Learn more…. Struggle with painful symptoms related to endometriosis? Recent research suggests a diet low in certain carbs and sugars can lessen discomfort. Learn more…. Sounds like science fiction, but researchers have created a “womb with a view”–where they can study the lining of the uterus in a lab dish as it goes through a monthly cycle to help pinpoint and treat uterine disorders, such as PCOS, endometriosis and cancer. Learn more…. Is a new hormone-free birth control on the horizon? Sometimes it can seem like no one seems to care about searching for an effective, safe, reversible hormone-free form of contraception despite the Pill, patch and other hormone birth control methods being linked to serious health risks and depression. Well, there may be hope. Researchers recently reported in the journal Frontiers in Bioscience that they’ve successfully tested what they call a “vaccine” against pregnancy that’s safe, effective and reversible. Learn more….